One of most popular colours, Inglenook is a soft blue-grey with just a hint of pale green. It shows very well when used with clean crisp colors. Depending on the lighting, it can look more blue, or more green. For busy-DIYers, Fusion Mineral Paint is the only choice for exceptional colour, coverage and durability. Unlike our competitors, we create our paint from the pigments up, and formulate it for lasting results. 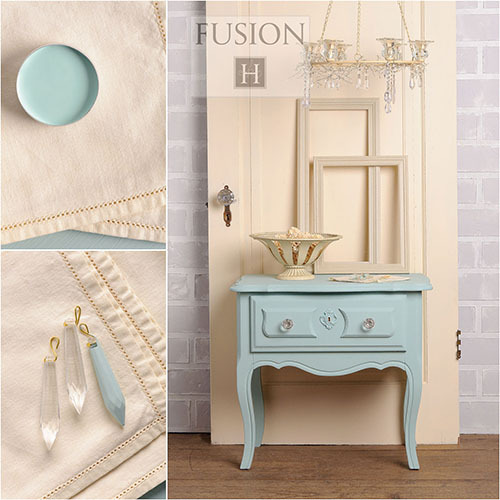 Our customers return again and again because Fusion Mineral Paint is supported by a knowledgeable retail network, that when paired with our product line makes it easy to paint it beautiful! Fusion™ colours are non-toxic, lead free, virtually odorless and have no volatile organic compounds (VOC), contain no ammonia or formaldehyde. Fusion Mineral Paint – Ceramic Pint While Supplies Last!